Chill@RI’s centre of operations – the cashier counter. It’s a lazy break in between lessons, and you’re not ravenous enough for a full lunch yet, but you still need some sustenance for that upcoming lecture (to prevent yourself from lapsing into the act of bobbing your head in a mocking show of zombies, no doubt). Where would a Rafflesian with such a conundrum head to? Chill@RI, of course! Despite having opened only last year in May, this minimart has already managed to establish itself as a part of the school’s hustle-bustle with relative ease, perhaps due in part to the quaint, convenience store-esque vibe it exudes. 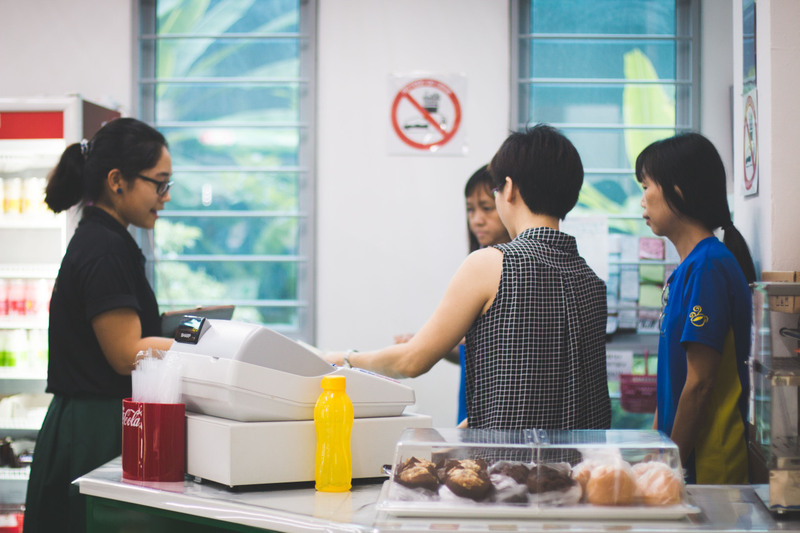 Many students have dubbed it their favourite place to grab a quick snack before CCA, and it is common to see a sizable crowd gathered around it in the afternoons. 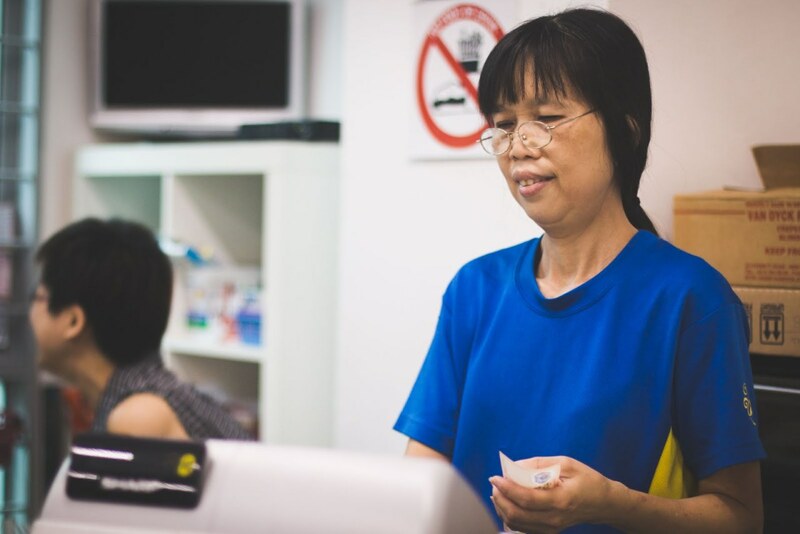 Of course, while we praise what Chill@RI has added to the culinary experience here, we musn’t forget to thank the ladies who man the counter of the minimart day in and day out. 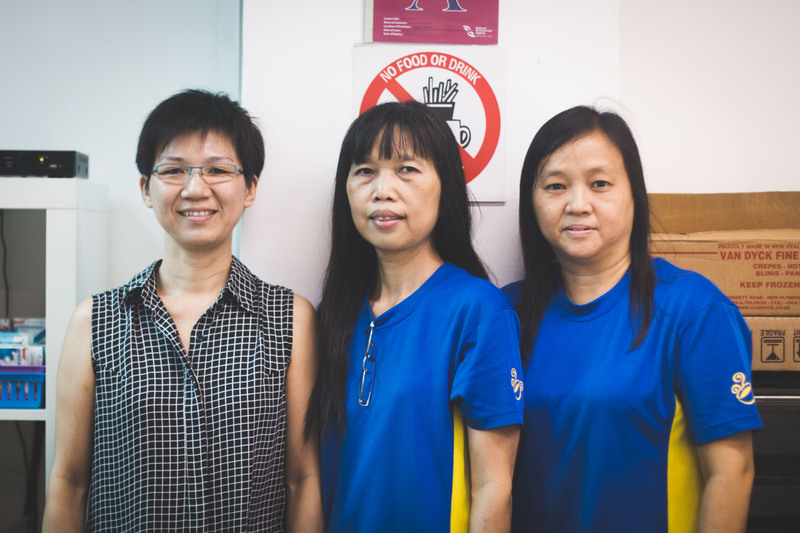 Always serving students with smiles are Ms. Sharon Koh, Ms. Pamela Lim and Ms. Siew Kiem of the Chill@RI staff, whom we had the opportunity last week to visit. From left to right: Ms. Pamela Lim, Ms. Siew Kiem, Ms. Sharon Koh. Although one may assume at first glance from the store’s slower periods, that the three of them have a fairly standard and leisurely time behind the counter, they also oversee other duties contrary to that; they also organize the place’s finances and stock, while constantly working to provide students with a constant source of foodstuffs and drinks. One has to admit – facing intimidating lunch crowds on a daily basis is something they deserve credit for. When asked how students have treated them so far, they reply (to our relief) that students are “friendly and considerate most of the time.” While there might be groups of people who cause a slight ruckus or hold up queues because of their dilly-dallying, they are few and far between, and do not pose any hindrance to their jobs whatsoever. As for how students can make their life slightly easier, they told us that we could take care not to block others, or loiter in front of the counter. So, the next time you visit Chill, do be considerate of your surroundings, as the space is narrow! There’s much more to working in Chill than just the job, it seems. On the bright side, aside from the basic interaction we have with them while purchasing food, during off-peak hours some students take the impetus to exchange words with them as well, brightening their day and making their job slightly more enjoyable. Ms. Pamela Lim maintained enthusiastically that, in spite of certain occasional shortcomings as mentioned above, “the majority [of Rafflesians] are pleasant!” To all the students, the three have this to say: “eat well and sleep well”, study hard, and keep persevering! 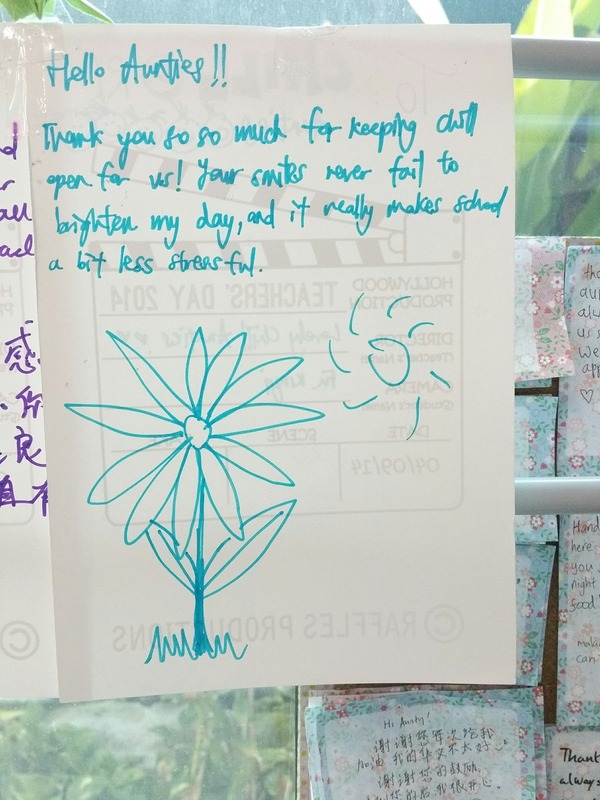 Notes of appreciation from Rafflesians – which the ladies display in their store. With that, we thank the three ladies for taking out the time from their busy schedule for us. It is indisputable that the presence of these ladies’ has contributed to a warmer, friendlier environment in school. Though you may not ever know their names even if you frequent Chill@RI, they will nevertheless continue to work hard behind-the-scenes, in order to serve your food with a touch of their diligent and humble service. Next time you visit Chill@RI, thank them with a bright smile for their work! Appreciation Week is a collaboration between students from The Humanz Initiative (THI) and Raffles Press that bids to recognise and appreciate the non-teaching staff members who do a lot that we often don’t value enough. Through our article series featuring individuals or groups around the school, we hope more will be encouraged to show their appreciation for the perhaps less-noticed staff members around the school; they may not be significant in their own right, but they definitely make a significant impact on our school lives.